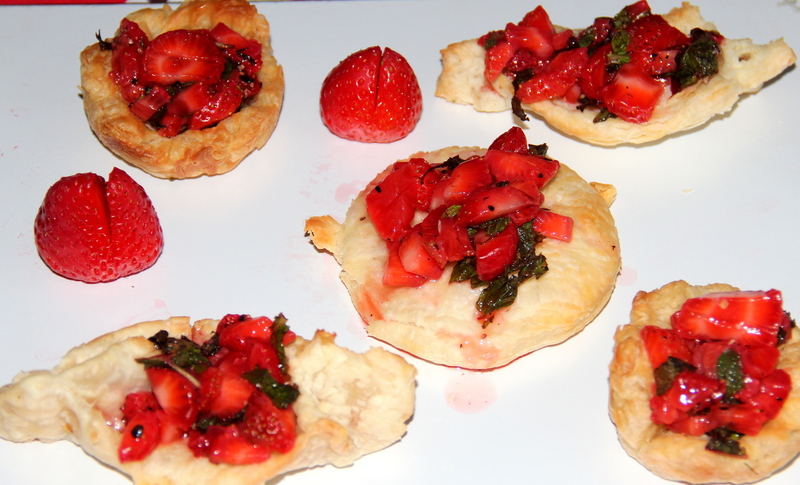 The warm tarts topped with the strawberries or any fruits mixed with little sweetener like honey/sugar plus ground pepper. This is so easy, no-fuss, crisp pastry tart topped with your favorite tart. This combination can be enjoyed warm and cold as warm tarts with cold strawberry mixture topped on the tarts. This can be served as an appetizer or even as a dessert by topping with whipped cream/cream cheese. Mix strawberries, mint, honey or agave nectar and black pepper in a bowl and refrigerate for sometime. Pre-heat the oven at 180deg C. Coat the muffin pan/baking tray with cooking spray and set aside. Cut the parathas into 2”x2” squares or any desired shapes and place one in each muffin cups to make tarts or can just mould into desired shapes and place in the baking tray. Bake for 13-15minutes or until the parathas are golden brown. Once baked take out of the oven and place a spoonful of strawberry mixture. If desired can spread cream cheese on the baked pastries before topping with strawberry mixture. Can include any fruits as a variation. Posted on August 18, 2014, in Dessert, International, Kids recipes and tagged Chitras healthy kitchen, drchdietfood, Frozen paratha recipes, Paratha recipes, Tarts from Parathas. Bookmark the permalink. 45 Comments. The strawberry tart looks delightful! Thanx Reyes. ….glad you liked….have a lovely day…. This is just so yummy Chitra 🙂 welcome back!!! Thanx Malar. …just tried it last week before my vacation and cream cheese is used for topping but I didn’t but still tasted good…. Thanx a bunch for your compliments…still learning and lots to learn am just beginner dear… ..Each and every encouragement and support means a lot…. Thanx ji. ….it was yummy and we enjoyed….have a lovely day…. OMG! It is sinfully tempting…. These strawberry tarts look so tasty. Thanks for sharing on Real Food Fridays blog hop. Will pin. Thanks Marla for the opportunity and nice to meet you.. These look great chitra, I could eat up a few right now! No dear just learning and long way to get that crown but support abd encouragement from all of you making me explore….so thanx to you all…. Mmmm – these look lovely and so easy too! Thanks for sharing them with us at Fiesta Friday!